Today we visited a new bridge being built in Tokyo Bay. Because of traffic into Tokyo Port it had to have a vertical clearance of about 55 m. Because it's next to Haneda Airport it had to be less than 88 m tall. 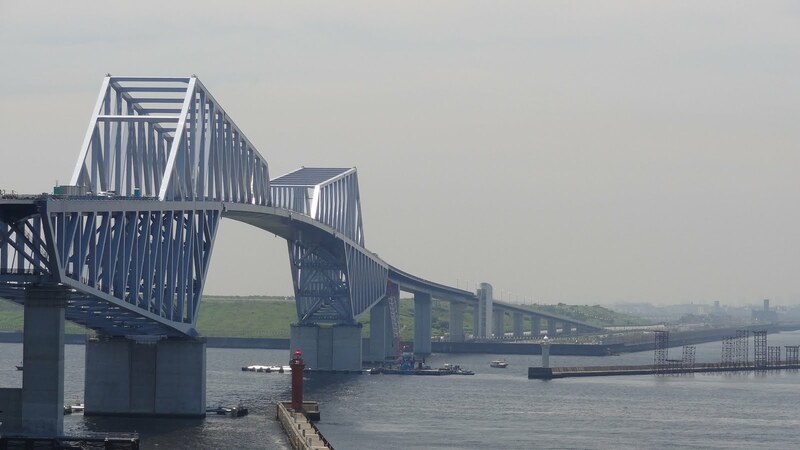 The unique shape with the truss staggered under and over the deck was the solution adopted by Japan's Ministry of Land Infrastructure and Transportation to provide a bridge across Tokyo Bay with a 440 m main span meeting those requirements. The truss sections were fabricated in Osaka and carried to Tokyo by barge. Unfortunately, a typhoon caused some damage to one of the sections as it was entering Tokyo Bay. Each truss segment weighed about 7000 tons, and required a fleet of floating cranes to lift onto the piers. Because of it's unusual shape the bridge has the nickname of 'Dinosaur Bridge.' It's scheduled for completion in October. When we were there, they were getting ready to put a riding surface onto the steel deck. Japan's Bridges: Tokyo Gate Bridge (東京ゲートブリッジ) In Tokyo Bay by Mark Yashinsky is licensed under a Creative Commons Attribution-NonCommercial-NoDerivs 3.0 Unported License.